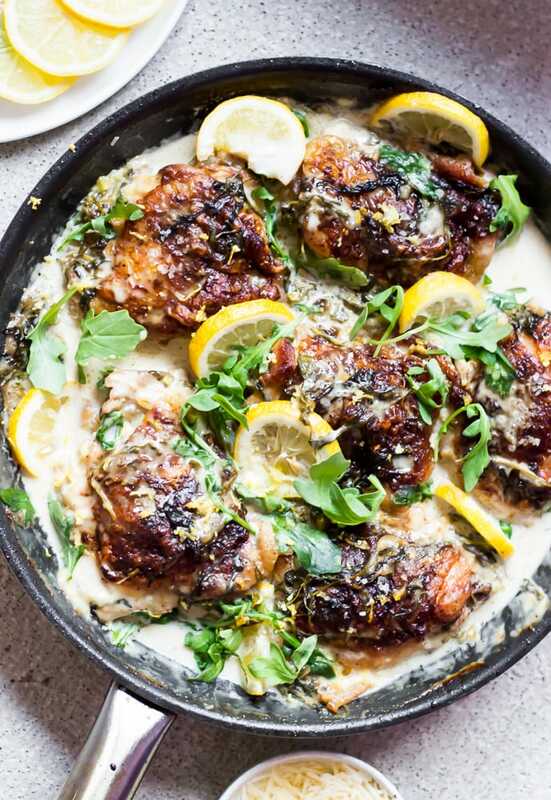 Tender, crispy, juicy chicken meets peppery arugula in a rich creamy lemon parmesan sauce. If you love chicken in creamy sauces then you have to try this restaurant quality dish. It’s a favorite of mine and I am glad to share this recipe with you. I am sure you are going to LOVE IT! Make sure you serve this with garlic bread! You may also like these other keto friendly meals, so tender (thanks to a genius and easy tenderizing technique), beef with broccoli with a twist, crispy but tender smothered chicken with bok choy and mushrooms or maybe, cheesy spinach steak rolls, beef asparagus rolls, or Italian dressing chicken (one of my favs just use keto Italian dressing). I can not believe there are people that do not like baked chicken. Actually, as I’m writing this, I just realized I used to be one of those people. What was I thinking back then?? I think my reason for disliking baked chicken was because I was so used to eating basic baked chicken all the time. I’m talking about baked chicken that was seasoned with a couple seasonings and not immersed in creamy sauces or any types of sauces. Don’t get me wrong, I still love regular baked chicken, but I love chicken in creamy or light sauce even more! One day I was browsing the internet for recipes using arugula, particularly creamy chicken recipes with wilted arugula cooked into the sauce. I didn’t see very many like this chicken arugula. I saw pesto sauces, basil creamy sauces, creamy asparagus sauces etc, so I’m happy to finally add this creamy arugula sauce with crispy chicken thighs recipe to the internet. 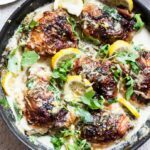 This chicken in creamy lemon arugula parmesan sauce has become one of my favorite chicken recipes. I love the peppery flavor of the arugula combined with lemon and parmesan, oh my goodness, just so amazingly good! The crispy chicken ties everything together. I can not get enough of it. The sauce, I swear, you could just drink it. It’s that good! I dislike washing dishes, so whenever I can use one pan, I will. To save time, (if you don’t mind using another pan) you can make the creamy sauce while the chicken is baking if you like (see notes below). I used chicken thighs but feel free to use chicken breast or boneless chicken thighs. I love bone in with skin on chicken thighs because they have so much flavor and I’m big on flavor. I didn’t serve this with pasta because garlic bread and a light salad were just enough for my family, but If you want, you can serve this meal with your favorite pasta. Season both sides of the chicken. In a large oven safe pan over medium high heat add the vegetable oil. Once the pan is very hot, add the chicken and cook both sides for about 3-4 minutes. Place chicken in the oven for about 20 minutes. Remove the chicken from the pan and set to the side. Drain the oil from the pan but reserve one tbs oil in the pan. (See notes below if you want to cook this recipe faster). Over medium heat, add the arugula and cook until wilted for about a min or two then add the rest of the sauce ingredients. Let the sauce come to a boil then pour the sauce into the chicken pan. Add the chicken back into the pan and place it back in the oven for 15 to 20 minutes or until the chicken is cooked through. Garnish with lemon and more asparagus (optional). Serve with garlic bread and or pasta. **To speed things up, you can also cook the sauce while the chicken bakes. Add the 1 tbsp of the chicken oil to the pan over medium heat and cook the arugula until wilted for about 1-2 minutes then add the rest of the sauce ingredients. Make sure the chicken bakes for at least 20 minutes before you add the sauce. Let the sauce come to a boil then remove the chicken from the pan and set to the side. Add the sauce to the pan then place the chicken back into the pan. Bake for 15 minutes or until the chicken is cooked through. Don’t forget to take a look at these other keto friendly meals, so tender (thanks to a genius and easy tenderizing technique), beef with broccoli with a twist, crispy but tender smothered chicken with bok choy and mushrooms or maybe, cheesy spinach steak rolls, beef asparagus rolls, or Italian dressing chicken (one of my favs just use keto Italian dressing). 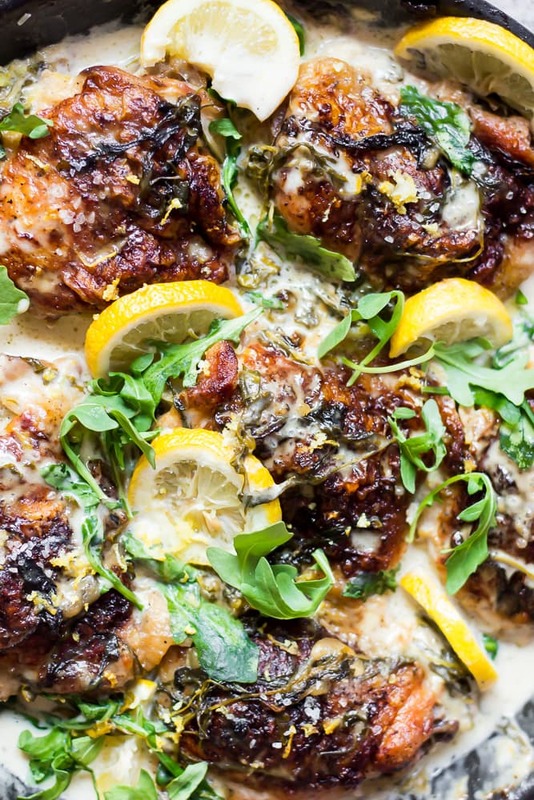 Tender juicy chicken meets peppery arugula in a creamy lemon Parmesan sauce. If you love chicken in creamy sauces then this you have to try this restaurant quality meal. It's a favorite of mine and I am so happy to share this recipe with you. I am 100% sure you are going to LOVE IT! Make sure you serve it with garlic bread! **To speed things up, you can also cook the sauce while the chicken bakes. Add the 1 tbsp of the chicken oil to the pan and cook the arugula then add the rest of the sauce ingredients. Make sure the chicken bakes for at least 20 minutes before you add the sauce. Let the sauce come to a boil then remove the chicken from the pan and set to the side. Add the sauce to the pan then place the chicken back into the pan. Bake for 15 minutes or until the chicken is cooked through. 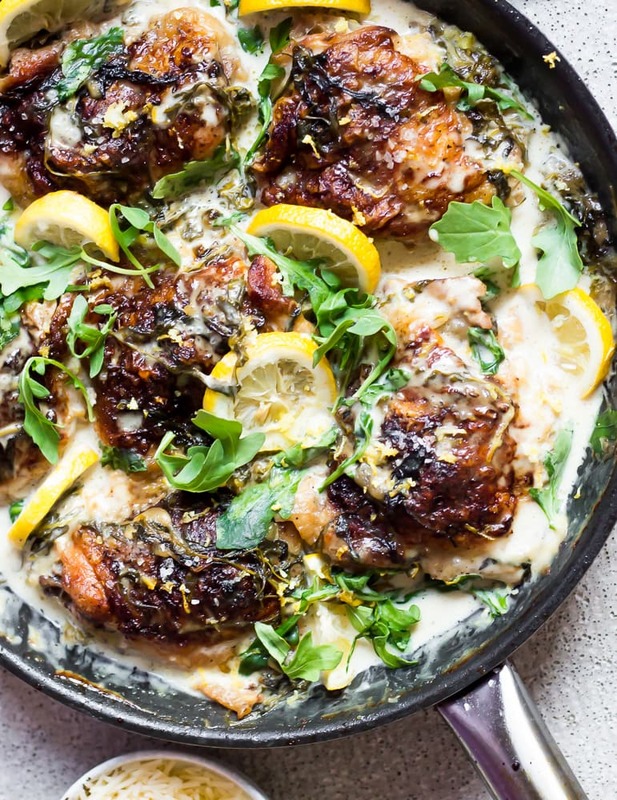 If you make this Chicken In Creamy Lemon Arugula Parmesan Sauce, snap a photo and hashtag #whiskitrealgud on Instagram!! I would love to see it!